"…A truth killer for the tracks of dance: riff of guitar slicing, rhythmic savage who balances, a voice of screamer and perfect choruses in answer…"
There's never been and never will there be, another Nathaniel Mayer. Mayer's fractured soul was a perfect match for Jack and Devora Brown's unique vision and the records he cut for their Detroit Fortune label - in their (tragically recently demolished) cramped studio on Third Avenue —which make up the entirety of his career on record—are the kind of otherworldly things so magical that they almost shouldn't be talked about, just listened to. 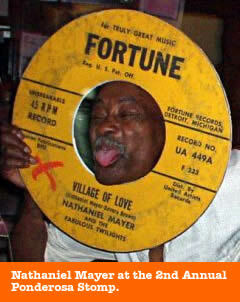 Mayer's song structure and individualistic approach was tailor made for Fortune and his first song "Village Of Love" was his biggest hit, still fervently remembered in Detroit today. The backing band was propulsive and raw, sounding as if they were about to explode at any minute, yet anchored by a drummer so solid and simple that they couldn't have derailed if they tried. It was this tension, bolstered by Mayer's high register vocals and the Browns' in-the-red recording techniques—all subtleties left at the door—that has endeared "Village Of Love" to the world of rock 'n' roll maniacs ever since. A casual review of the rest of his work—most notably the ethereal "I Had A Dream" and the telling "I Want Love And Affection (Not The House Of Correction)"—begs the question: If Gordy's Motown was "The Sound Of Young America" what was the Browns' Fortune—"The Sound Of The Ghetto"? The guitar work was tremelo-damaged, the drums so distorted that they threatened to shatter the ribbons of the microphones, the occasional flute adding a whole 'nother dimension to everything. 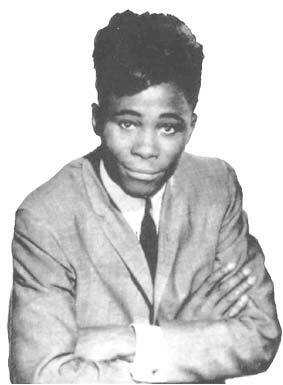 In classic Mau-Mau fashion, Mayer's whereabouts were practically unknown and only ever confirmed by vague rumors over the past several decades, though he did surface in 1980 with a single on Love Dog Records entitled "Raise The Curtain High." Never having been without brilliant names for his backing groups (The Fabulous Twilights, the Fortune Braves…), the credits on "Curtain" took things over the cliff: "Nathaniel "Nay Dog" Mayer and the Filthy McNasty Group plus Free Style." Disappearing into the ghettos of Detroit for the next two decades, every rumor imaginable compounded to turn Mayer into a walking urban legend. By the time Norton Records issued the amazing, previously unreleased Gino Washington production "I Don't Want No Bald Headed Woman Telling Me What To Do" last year, the underground was primed for the return of the Nay Dog and they got more than they could have ever hoped for when he utterly devastated The Millenium Theater on July 20 at The Detroit Legends Show. From the second he took the stage, it was evident that, to paraphrase Ike Turner, Nathaniel Mayer was taking back his name. And with a vengeance of atomic frenzy! Showing up with his own fully rehearsed band, Mayer strolled proudly from behind the curtain dressed from head to toe in a white tuxedo and tails. Leaping into the air, he shot his left hand out at the drummer like a bolt of lightning, and the snare sounded a crack of thunder that hadn't been heard in over thirty years. What followed was possibly the most amazing set by any artist, young or old, that this Mystic Knight has ever witnessed.